Probably nothing plagues mothers as much as feelings of guilt about things they have done – or haven’t done – to or for their children. A father once said to me, “Guilt is not my thing.” Unfortunately, it does seem to be a mother’s “thing”. One reason for that is the great sense of responsibility a mother feels for her child. Another is the power to influence children – both for good and for bad – that has been attributed to mothers, in child development research as well as in popular literature. But perhaps a major source of guilt is the anger we sometimes feel that is provoked by children’s behavior. Children really know how to push our buttons, and we’re always struggling with their behavior that gets to us the most. Even when we control that anger, it feels so powerful that we worry about what we might do if we “lost it.” Sometimes we do….and what follows, of course, are feelings of guilt. Telling someone not to feel guilty is futile. Besides, guilty feelings can be quite useful if they lead us to rethink some of the situations that brought those feelings about. For example, in a recent article I wrote about a mom who was upset and worried because her child refused to leave school with her when she came to pick him up. In fact, she was really quite angry with him for not appreciating the effort involved for her in leaving work to come to school. As a working mom, her son’s behavior felt to her like a reproach for being away from him. In fact, it may very well have been a reproach on her son’s part, but that didn’t mean she was doing a bad thing by working. Children don’t like everything we do. They don’t have to. Underneath it all was her own unresolved conflict about working – her feelings of guilt about not being there full time. And it was these feelings that got in the way of her ability to simply acknowledge her son’s feelings. I have seen many instances in which a mother’s conflict about working leads her to go over and beyond anything realistic in what she does to make up for her own guilt. Invariably this kind of sacrifice leads to anger, which, if expressed, leads to more guilt. So that when we say that a child pushes our buttons, we are usually referring to something unresolved within ourselves that makes us over-react. This doesn’t mean that a child’s behavior may not be provocative, even unacceptable. What it does mean is that if we are reacting to something within ourselves, that becomes a handicap in responding to our child’s behavior effectively. Our own anger and then the guilt it causes get in our way. Another mom talked about how guilty she feels for blowing up when her daughter comes out of her room after being put to bed at night . As a working mom, she spends every minute she can with her child when she gets home; but by the end of the evening she has nothing left to give. Dad has offered to do the bedtime; but mom won’t let him because of her feeling that somehow she has to make up for all the time she is away. Here, too, it is her own conflict about working that leads her to compensate inappropriately, with an outcome that only makes her feel worse. Mothers who are home with their children can also get caught up in the same kind of feelings. A mom wrote to me about the anger and frustration she feels when after a whole day of doing things for and with her children, they complain about something she hasn’t done. She finds herself trying to prove to them how much she has done for them. 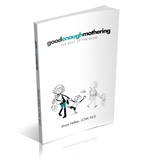 It seems that many mothers today have a completely unrealistic idea about what they should be doing to qualify as “good mothers’, and end up paying for these ideas with anger and guilt. Sometimes, it is when children behave in ways that were not tolerated when mom herself was a child that leads mothers to blow up and then feel guilty. Mom was made to feel like a “bad girl” when she did those things, and now she feels like a “bad mother” when her children do them. Her reaction is out of proportion to the behavior, because it has touched off something within herself. The point is not to use guilt feelings to beat yourself up about something you think you did that you regret. Use them constructively to take a step back and rethink what happened. In the same way that understanding your children’s behavior can help you become more effective in dealing with them, understanding your own behavior can accomplish the same thing. Ask yourself what it really was that was bothering you. If you can get in touch with those feelings instead of the guilt, it can help you figure out a better ending the next time around.